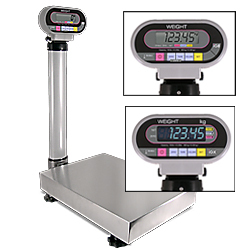 The Ishida IGX & IGB Series Bench Scales has capacities as high as 300 lbs. Convenience of the high-visibility pivoting display and added checkweigh function. Choose the IGX for the bright VFD display, or IGB for the crisp LCD design and battery operation. Since AC power can be tough to come by in remote work locations, the Ishida IGB model operates with an optional AC power adapter or batteries. It’s designed to provide 500 hours of continuous use on two “D” batteries, so you can be assured the scale isn’t going to quit in the middle of a job. Its 5-digit LCD display clearly denotes weight and other information that is easy for operators to read. When you work overtime your equipment should too. The Ishida IGX model is equipped with an extra large, ultra bright 5-digit VFD display that is easy to read in low light conditions. This model runs on standard 115VAC power with the included AC adapter. Both models available from Central Carolina Scale provide an audible signal and visual warning that alert operators when weight tolerances aren’t within range. This “on the spot” checkweighing will prevent costly errors and waste. At under 38 pounds, the Ishida IG Series scales are truly portable NTEP Approved weighing solutions. And with platters that are built with durable stainless steel, they’re easy to clean between applications. 84989 .... IGX 150 lb/60 kg ..............VFD ...........15.75" x 21.65" x 5.43"
84990 .... IGX 300 lb/150 kg .............VFD ..........15.75" x 21.65" x 5.43"
84991 .... IGB 150 lb/60 kg .............. LCD ..........15.75" x 21.65" x 5.43"
84992 .... IGB 300 lb/150 kg ..............LCD ..........15.75" x 21.65" x 5.43"